Washington D.C.-based rapper Wale is showing a lot of promise on his third official full-length, “The Gifted.” There is a feeling of maturity on the album, a sense that Wale wants to be taken seriously as a musician, which is a tough barrier for a young rapper to overcome. He is still young though, and a fun-loving sense of immaturity bleeds through the record, in really enjoyable ways. While some tracks are tight and serious, some are loose club jams, and they all blend together to make a diverse album where nearly every track stands out from the previous, even if some are not overly creative. Wale toys with a few rap cliches on the album, all of which are gleefully effective. The album’s leadoff single, “Bad,” is the last track of the album. But a remix of the song (featuring Rihanna), shows up seven tracks earlier, and even though the two versions sound very similar, the remix serves as an actual track and not something tagged on the end to extend the album’s running time. 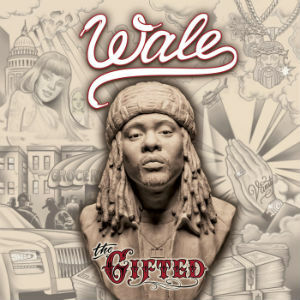 The album’s title – “The Gifted” – is a play on egotism in rap (and the album dropped only one week after Kanye West’s “Yeezus”), as Wale’s goal for the album is to try to establish himself as a musician, not to gloat about his previous work and success. The album’s best cliche is the second-to-last track, where Wale teases at his next project. But instead of teasing at a proper duet, like Watch the Throne, he teases at “The Album About Nothing,” an album – that’s actually happening – that he is recording with Jerry Seinfeld. Seinfeld appears on the tease, showing up to the wrong recording. It’s a great moment that sets up an album that will probably be a great and glorious mess. At seventy minutes, the album does feel long. It takes some effort to make it all the way through. Some fat could have been trimmed, and maybe one or two of the less mature tracks could have been cut. Getting to the track with Seinfeld and “Bad” is a pay-off at the end, but the album does not need to be as long as it is. Still, it is a solid and creative effort from a man trying to prove his place in the music world. I think he succeeds.